First Impressions: I was a bit leery about purchasing this budget .45 (how good could it be for only $350 out the door?) However, being on an extremely tight budget and after reading numerous positive owner postings I decided to take the plunge. Fit, finish & trigger were very good right out of the box. I didn’t care for the smooth hardwood grips so I installed a set of Pachmayr Signature Grips. I wanted night sights so I installed a set of Meprolights (Note: the RIA front sight tenon is smaller than the Meprolight’s .125” so the Meprolight had to be thinned a bit to fit). Since I plan on firing only ball & +P, I installed a Wilson 18.5 lb recoil spring. The barrel to bushing lockup is tight, and the barrel is hard-chromed both inside and out. I cannot discern any movement of the barrel where it contacts the bushing, yet I can still remove the bushing by hand without using a bushing wrench. Shaking the pistol reveals a very small amount of rattle. Complaints: The thumb safety was far too easy to manipulate out of the box, a minor mechanical issue and easily corrected by my ‘smith (who, BTW, was very impressed with the quality of the RIA after working on it). The thumb safety is now much more positive w/no danger of accidental engagement/disengagement. The only other complaint was that the factory Novak magazine wouldn’t drop free (however, after a bit of handling and use it now drops free without a problem). Range Test: I fired the Winchester ball first, then the Pro-Tech ball then the Federal EFMJ last, rotating through the mags in case one or more should prove troublesome. 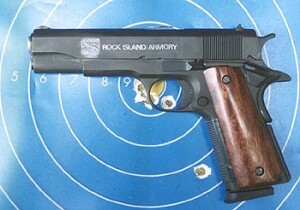 Each magazine was tested fully loaded at least 4 times. Ranges were 25m-100m. I neglected to bring my reading glasses & rest so I did not shoot for group size (this being more of a break-in & reliability test anyway). The pistol was not cleaned during the entire test. Accuracy: If I did my part, all shots were to POA (point of aim) with numerous hits on small water bottles at 25m-40m. I was close enough at 100m to “distract” the target but registered no hits at that range. However, this was with the Meprolights so I cannot comment if the factory sights were as on or not. I plan on shooting for accuracy from a rest next time and will post the results. Reliability: The pistol was 100% with all ammo & mags tested (surprising since I expected some problems with the factory magazine). All brass fell in a neat pile 7′-9′ to my right. The single incident worth noting happened near the end of the Pro-Tech ammo (nearly 200rds fired by then). After the last round in the magazine, the slide locked back as it should and I noticed the empty casing was still in the chamber with a couple of dents/notches at the front of the case mouth. Current Complaints: The McCormick mags are for the most part still not dropping free although they are improving with use (3 mags will now drop free about 50% of the time), and I have a very mild case of hammer bite. At 200 rounds I had a small welt and the skin barely broken, but no blood. It’s so mild that I don’t want to go the beavertail/bobbed hammer route so I’m hoping I can find a fix that won’t require a lot of work and new parts. Federal EFMJ: I attempted to recover an expanded bullet by firing a single round through 5 gallon water jugs from approximately 15′ back (not back far enough, still got wet!). Apparently, my aim was slightly off as the slug exited the 4th jug high left and missed the 5th jug entirely. Recoil did not seem noticeably worse than standard ball. Conclusion: 232rds does not an extensive test make. 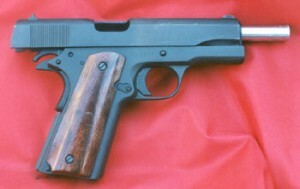 However, I’m very impressed with the RIA .45 for the price. While obviously not a Kimber or similar make IMHO the RIA .45 is an excellent entry-level .45 you can customize/modify to suit your needs w/o breaking the bank. Only time will tell how durable it is.